Marshall Dodge and Bob Bryan began swapping funny Down East stories when they were students at Yale in the 1950s. 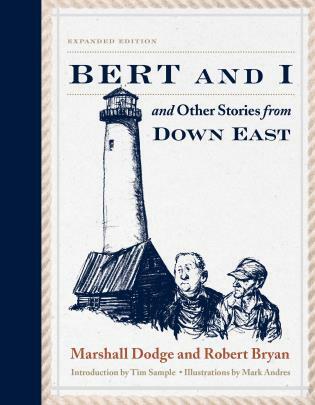 Their fascination and appreciation for Maine and its people triggered the production of several “Bert and I” records, from which 14 stories were selected for the first edition of this book. Now, eleven more have been added for this expanded second edition. Dodge and Bryan were groundbreaking in their appreciation of the oral tradition and paved the way for contemporary storytelling icons like Garrison Keillor, Tim Sample, and Tom Bodett. Marshall Dodge lectured and performed throughout the country and appeared in several PBS productions, including A Fresh Breeze Down East and In the Kitchen. Dodge started the Maine Festival of the Arts in 1976, and in 1982 he was killed in a hit-and-run car accident. An Episcopal minister and bush pilot, Robert Bryan founded the Quebec-Labrador Foundation, which for going on fifty years has conducted programs in education, community service, and environmental resource management in northern Maine and eastern Canada. Bryan lives in Quebec and Ipswich, Massachusetts, and is currently at work on a memoir, Turn With the Sun, about his work as a minister and his more than 12,000 hours as a bush pilot.